What if you could do more than just consume music as a passive listener? It’s a question that has fascinated musicians ever since the dawn of digital technology. Now, a very big label is releasing an app that provides an answer to that question. 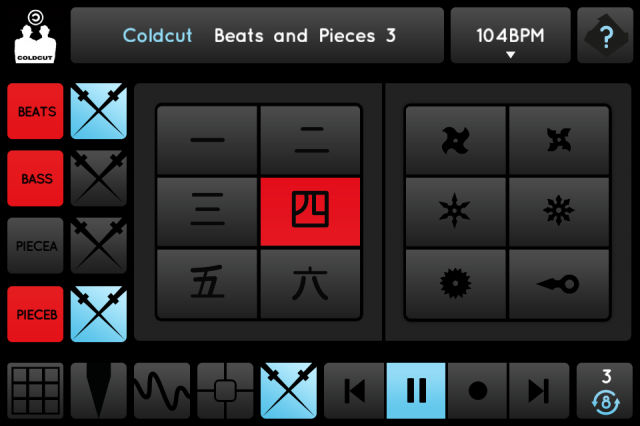 Ninja Tune – and, crucially, founder Matt Black of Coldcut – are going to mobile platforms with an app that does far more than simple remixing. It can let you radically transform some of Ninja’s artists, even going in a direction that might be considered instrumentalism. CDM contributor Matt Earp has been quiet in these parts in the last months partly because he was contributing to the project. He and the developers give us an exclusive look inside the process of making this app and what it means. And don’t miss the making-of video; the final app as it ships is built in OpenFrameworks and libpd. Venerable independent UK electronic music label Ninja Tune have launched Ninja Jamm, their first music remix app, in collaboration with London-based arts and technology firm Seeper. 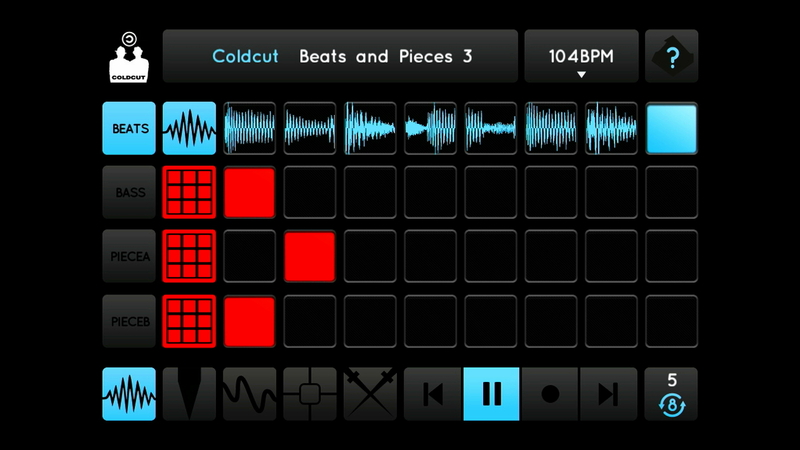 It’s been created (for now) for iOS and it’s filled with tunes and loops from Ninja artists. Seeper have produced the “making of” video above that tells the app’s story, and both organizations answered some of CDMs questions below. It’s live in the app store as you read this and free to download, so grab it while you finish the article! Ninja Jamm is basically a smart but simple remix sequencer that users can load up with “tunepacks” from Ninja’s catalog – all purchasable through the app. These tunepacks are tracks broken apart into a 4×8 matrix of clips, 8 each for drums, bass, and two more (melody, keys, vox, FX) depending on the tune. Most clips come from the original tunes, but some extras have been added to round out the bill. Users can turn instruments on and off, swap between clips, glitch them out, add effects like reverb and crush in a number of different ways, trigger the “Coldcutter” for beat-repeat action, trigger and pitch-bend stabs and one-off samples, and even change the tempo of the track. “Jammers” can record what they’re doing as they mix and instantly upload the whole thing to SoundCloud when they’re done. It packs a fairly dizzying array of sonic options into a small screen, but you’d expect nothing less from creative director Matt Black, one half of Coldcut – Coldcut did give the world “Beats and Pieces” and are synonymous with the cut and paste aesthetic of large swaths of electronic music spanning their 25+ year career. It’s an ambitious project for a record label to make something this complex, and while Black is familiar with writing a line or two of code, he’s far from a iOS developer, and Ninja Tune is far from a software development house. Enter Evan Grant and Seeper – he and his team have done multi-touch interface, projection mapping, and interactive design for some of the biggest names in the world – BBC, MTV, Ted, Xbox – It seemed like a natural fit, but there were challenges. Grant: “We’ve worked with major music labels before and put sound design and music at the core of all our installation and event projects. We develop hardware and software all the time, but this is the first time we’ve released a public mobile app.” Apple’s design specs are rigorous even for the most experienced team. A video of a prototype of the app in the hands of Amon Tobin surfaced last summer, but concerns about stability and a desire to keep making it even better kept it from launching then. Still, hard work and a relentless desire to fix a bug list a mile long prevailed, and the team received approval from Apple a few weeks ago. “The concept’s genesis is in software created for [Coldcut’s] 90s projects such as Tonetrakker, DJamm and the Let Us Play software. For the 1997 ‘Let Us Play’ album, Coldcut and Hex released a free CD-ROM including our first mixing software ideas like My Little Funkit and Playtime. These let the user swap between loops, fire samples, and randomly cut them up. In 1998 we made a more controllable 4 channel loop glitching engine for our live shows, called DJamm. We got a deal with Steinberg to release it, but we never finished it – though we did release the glitching shuffle algorithm as the Coldcutter VST plugin. Will there be new music released for the app after launch? Yes, new tunepacks coming every 1-2 weeks. An exclusive track from Luke Vibert is in the works as well as the mighty “Witness” from Roots Manuva, and tunes from Emika, Mixmaster Morris, Slugabed, Raffertie, Lapalux, Shuttle, Toddla T and many more Ninjas. Possibilities for themed packs and artists from beyond the Ninja fold are also on the horizon. Do artists receive any royalty from the downloads? Yes, artist receive a cut when jammers buy the tunepacks. 44k 16 bit for ultra high quality sound. Can users export or share the jamms they create? Yes, they can upload to SoundCloud at the touch of a button, then share on Facebook, Twitter, Tumblr, or wherever else they can think of! How did the Seeper/Ninja Tune partnership come about? Evan Grant: We’re all Ninja fans at Seeper so when Matt and I started talking about a collaboration it was really exciting. It was clear we shared a passion for innovating with interactive sound and vision, and we agreed there was a need for a next generation jamming app. Why launch on iOS, and are their plans to release on the Android platform? Matt Black: You have to hand it to Apple, their introduction of touchscreen mobile computers has been a real game changer. iOS is the most mature development environment and Apples App Store system helps get us and the artists paid. We do love multiculturalism and will support Android as soon as we can earn a few bucks to pay for the conversion. What were some of the major technical hurdles you faced, and how did you overcome them? EG: The audio engine is built in ‘PureData’ and run’s on mobile courtesy of ‘libpd’. The user interface is built in C++ using Openframeworks with the store developed in device native Objective-C”. The downside of this approach initially was performance. Using open source libraries results in a overhead, a lot of time went into resource and speed optimization throughout the app. MB: Yes, the choice to use Pd was at least partially inspired by the enthusiasm the CDM community has shown for it. Using open software like OpenFrameworks is inline with everything we stand for. Unfortunately, whilst Pd is a fine and useful construction kit, it’s not that efficient as code, so Ed had to work very hard to get the Pd core audio engine to handle the playing and processing of 4 stereo channels with fx. Pd uses 32-bit audio so it takes double the memory of 16-bit samples, again not very efficient. Did working with Lossless / high quality audio present any problems? MB: Yes, many apps use mp3s or 22k audio. Being DJs and music heads, we knew we didn’t want to compromise with the sound quality, so we held out for 44k 16 bit uncompressed. This means content takes longer to download than an mp3, but the end result is far higher quality, and you can actually play Ninja Jamm in a club on a big sound system and hear your work properly. What are the plans for the project after launch? Forthcoming features you hope to see in future releases? 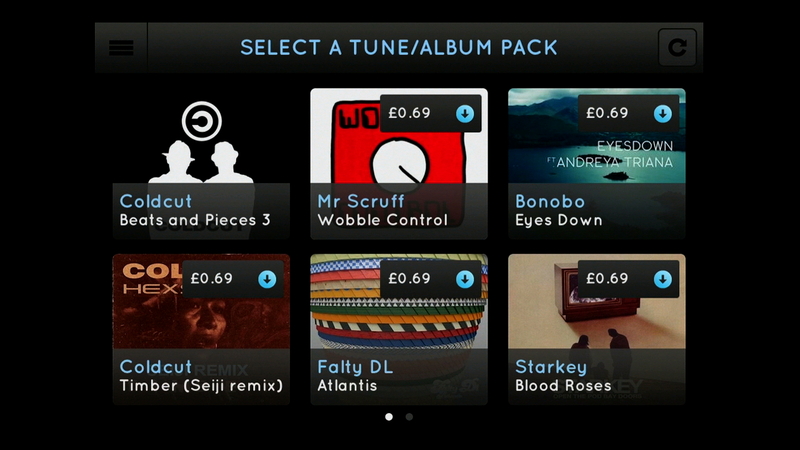 EG: We’re working with Ninja Tune to align with new releases, so lots of cool new content will be available. We see this as the start of a genre of ‘jammboard’ apps using the ‘tunepack’ format. MB: Yeah, we have a feature list a coupla metres long already. The no .1 feature for us and everyone else is the ability to load your own samples, but this could conflict with the business model which is centered on saleable Tunepacks, so right now we’re thinking about it. Sync between different copies of the app would be fun. Vol controls for each channel should be possible. If we can get a decent community of jammers who get what we are doing and buy enough packs to support future dev, we vow to keep on with maximum effort and never surrender. Where can users go for info on updates? ninjajamm.com will be our main hub – It will feature charts of mixes created by Ninja Jammers that have been uploaded to SoundCloud, as we expect the community and competitive aspects of NJ to be important. Also the Facebook page and Twitter feed should keep you up-to-date on all the news.